The color scheme of the Adidas Ultra Boost ST Parley was lauded by many consumers for being eye-catching. People generally liked the high-quality build of this running shoe. ‘Comfortable’ was a word that was frequently used to describe the experience while wearing this product. The use of recycled plastic on the upper unit was appreciated by environment-conscious runners. Wearing this shoe for extended periods didn’t cause any discomfort, according to several purchasers. A few testers claimed that the fit was a bit narrow. Some overpronators felt that the underfoot support system wasn’t as prominent as other stability options. There were complaints that the price was too costly. The Adidas Ultra Boost ST Parley was well-received as a running shoe that has an effect on the environment. The use of recycled plastic was liked by consumers and shoe-enthusiasts. Most of the testers were also happy with the comfortable performance of its parts, the appealing design, and the overall quality of the materials. On the other hand, there were gripes about this stability option, such as the narrow width, the less-supportive platform, and the high price. Adidas Ultraboost ST Parley - It’s like a couch for your foot! 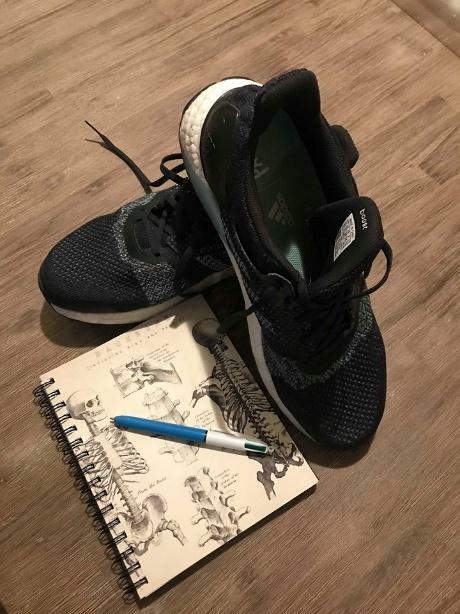 Pictured below with my run performance log and trusty 4 colour bic pen sits the Adidas Ultraboost ST with ‘parley ’ upper. This shoe is mistaken by many for a purely casual shoe, better worn to the cafe with your activewear than on a running track. To be clear, I think this is a mistake. Sporting 100% ultra boost midsole with arch support, split heel counter, prime knit ‘parley ’ upper and functional logo midfoot saddle, this shoe provides comfort style, flexibility, and support. I tested it over the road, light gravel (mostly 10mm or less rocks), moderate gravel (rocks up to 15-20mm), grass, treadmill, and footpath. I ran 5km and 10km distances in various styles, the shorter runs were intervals on the treadmill and fartleks on the footpath and the longer 10km runs were pretty much just for distance as opposed to hitting a time or pace goals. I also did one 5km trail run. Let's unpack this piece of kit from the top down. The primeknit upper designed in conjunction with parley is comprised of approximately 11 ‘upcycled’ plastic bottles rescued from beaches. Firstly, I confess this really makes me feel warm and fuzzy. I love it when a company makes a statement like this. Further to this environmental consideration, the upper is extremely comfortable. In fact, one of my customers tried it on and declared that "its like a couch for your foot!" I have a suspicion that the extensive cushioning and soft first feel of the upper is one of the reasons some people tend to underrate this shoe as a running shoe. What they don’t appreciate is the effort Adidas has gone to. Running in this shoe, I found that though very soft and yielding, this upper did provide me with a good amount of support. If you prefer the more locked in feel of shoes like Asics Kayano and Brooks Adrenaline, you will find the feel of this shoe to be sloppy. If you prefer a little more flexibility and softness this shoe is perfect for you. The extra cushioning around the rearfoot is plush but likely where the extra bit of weight comes in bringing the shoe to around 298g. I really enjoyed the flexible, yielding but snug fit of the upper overall. The one downside is that when running around corners, I felt like at the midfoot, the foot on the opposite side to which I was turning felt like it was sliding inwards off of the midsole, perhaps the midfoot saddle was not quite firm enough. That said I am 90kg, someone weighing in a little less than me may not feel that so much. I have definitely found that customers of my weight or heavier have described the shoe as not feeling supportive enough in the upper so if you're pushing the tonne, maybe look for an upper with a little more hardware. I like the flexible external Adidas heel counter they used in this shoe. It doesn’t provide the "locked in" feel so many customers describe that they love in other shoes with the full wrap around counter but it does the job just fine. The research I have read explains that the more solid heel counters don’t necessarily prevent the heel rolling in any more than a flexible one. For a little more on this heel counter check out my review on the Adidas Solar Glide. As I highlighted in my review of the Solar Glide, the ultraboost midsole is outstanding, very soft and very responsive. I won't go on too much about how good the material is as you can just follow the link and have a look. What I will discuss is the fact that this is the ST version of the ultraboost, Adidas has packed an additional 500 boost capsules under the medial arch of the foot here for a total of 3000 capsules in this midsole unit. I like that they use the same material because some companies I believe vary the types of EVA to change the stiffness of the midsole at the arch. My concern with this is that those two different types of EVA will degrade at differing rates resulting in a harder more dense medial post (piece of arch support) that changes how much it affects the angle of your heel as the softer element wears out. Not to put too fine a point on it, I feel the risk is that you may be more likely to roll your ankle as that more traditional style of shoe begins to wear in the softer part of the midsole. I feel that as the TPU (thermoplastic urethane) of the Ultraboost is the same material throughout it should degrade at a consistent rate and thus be unlikely to cause the aforementioned issue. Tech speak out of the way, I love the feel of this midsole, the arch support felt like pillows hugging the arches of my feet beginning to end. During some speedwork, I did notice some heat generation in the forefoot but not an uncomfortable amount. There are two issues for me with this midsole. Firstly, I think it is too soft for moderate gravel, it molds nicely to the terrain and flexes when you want it to and gives an accurate feel of the road or trail as it changes but I feel coming downhill on moderate gravel it was just too soft and flexible. For road, footpath, and treadmill it was divine. To be honest, I only took it off road to see how it would go, it is not a trail shoe so to expect it to perform well would be unrealistic. My second issue is as I pointed out, heavier wearers have commented that it’s too soft. To put a figure on it I’d say if you’re running, avoid 100% ultraboost midsole if you’re over 90kg. Towards the end of testing, I did notice that to the left of the sole of my left forefoot (between the 4th and 5th metatarsal for those of you with medical knowledge) I did develop soreness that plagued me for a few days. However I’m not 100% sure if it was because my left foot was a little wide for the shoe, the forefoot cushioning was too soft and not stopping enough ground reaction force or if it was the Nike Pegasus I spent 5 hours I at the Royal Adelaide Show before going for a 10km run in the Ultra boosts. The one piece stretched web continental rubber outsole feels great! This is the second pair of shoes I have experienced it in and I really like it for road and treadmill running. I will say though that it lost grip coming down and going up steep hills on a trail with moderate gravel just for those of you who like to use one shoe for everything. After 70km under my 90kg frame at various paces and on various terrains, there’s no visible wear on this outsole. As you can see pictured below, there are gaps where you can see the midsole. This makes the shoe a little lighter than it would be if the rubber were solid so that is good design work on Adidas’ part. There’s no drawback to this feature either, rocks and twigs don’t get stuck in the soft material or anything like that if you were wondering. The outsole and midsole form a nice flexible unit, you can feel the ground nicely underfoot as it undulates but the softness of the midsole accommodates and flexes so that your foot is not affected by the changes in terrain. Plush, plush, plush, couch for your foot indeed. This shoe is remarkably comfortable, the word deluxe comes to mind. If you’re walking or running, the inner of this shoe is just like a couch for your foot. No negatives, no downsides here, just lux comfort all the way. Weighing in at 298g and sporting a comfortable 8mm heel toe drop, the Adidas Ultra Boost ST Parley provides a lux first feel and keeps on giving. Every element of the shoe adds to the comfort and for a running shoe it does have a touch of style as well, so you can head out in your activewear and grab a latte with your mates and still look good. I would recommend this shoe for any walking or running activity on the road, grass, footpath or treadmill. I would stay off rugged trails and avoid activity that requires you to corner fast especially if you weigh more than 90kg. It provides a combination of flexibility and stability that is great for a moderate pronator who doesn’t rely on that really rigid locked in feel you get from some of the more traditional style stability shoes. I love this shoe. I recommend it if you guys have flat feet, wide feet, you have to try it on. The Adidas Ultra Boost ST Parley is a running shoe that’s designed for those who have overpronation. It makes use of a dual-density foam on its medial side to support the arch and prevent it from buckling during the run. The more robust midfoot blends in with the full-length midsole as it’s made using the same material. The outsole makes use of Continental™ rubber to maintain traction on both dry and wet surfaces. It’s placed in a Stretchweb configuration to maximize platform protection and foot flexibility. A knitted material serves as the upper unit of this product. It has a lightweight configuration, and it resembles the structure of a sock. A stitched-on saddle offers a bit more support to the sides of the foot while an external counter holds the heel in place. The Adidas Ultra Boost ST Parley was created using the standard measurements. Runners can purchase a pair with their regular sizing preferences in mind. Widthwise, the variants are D – Medium for men and B – Medium for women. It accommodates those who have medium foot-dimensions. The outsole unit makes use of the Continental™ rubber, which is commonly used in car tires. The purpose of this material is to protect the midsole from the abrasive nature of the asphalt. It also doles out surface traction. The Stretchweb design involves the sectioning of the rubber compound to cover the entire surface of the platform. Traction nodes highlight the grip capacity of the outsole, while shallow grooves encourage the flexibility of the wearer’s foot. The midsole unit features the boost™ cushioning foam, which is born out of the amalgamation of thousands of thermoplastic polyurethane bits. Its job is to cushion the landing impact and energize the forefoot lift. The medial side of the midfoot features a dual-density boost™ foam. It aims to correct overpronation and prevent the arch from bucking during the running session. Primeknit is used for the upper unit of this Adidas running shoe. This material resembles the structure of a sock, with a knitted fabric embracing the form of the wearer’s foot. It offers a lightweight and breathable wrap. A flexible saddle is stitched to the midfoot section. It connects directly to the lacing system, thereby enabling a custom fit that adheres to the tightening and loosening of the shoelaces. A fabric counter is fashioned on the back of this running shoe. Its purpose is to hold the heel in place and prevent it from wobbling or exiting the foot-chamber accidentally. A pull tab is added to heel collar. This fabric loop is meant to help runners when it comes to putting on and removing the Ultra Boost ST Parley.